As the cold days of winter wane and flowers begin to bloom, thoughts quickly turn to spending more time in spring sunshine. What better way to soak up some extra Vitamin D than hitting the open road in a new convertible? 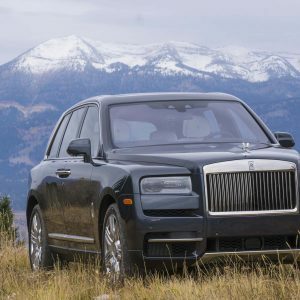 And if you’re imagining yourself behind the wheel of a new drop-top, you’re in luck — the U.S. car market offers nearly 40 options for open-air motoring, ranging from the budget-conscious and somewhat practical to the ultra-luxurious and extremely exotic. 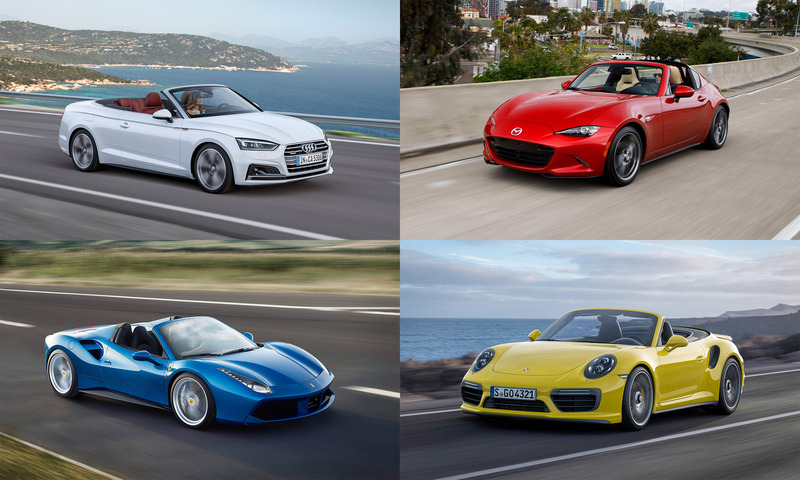 Take a look at this year’s convertibles to discover the best fit for your budget and your lifestyle. 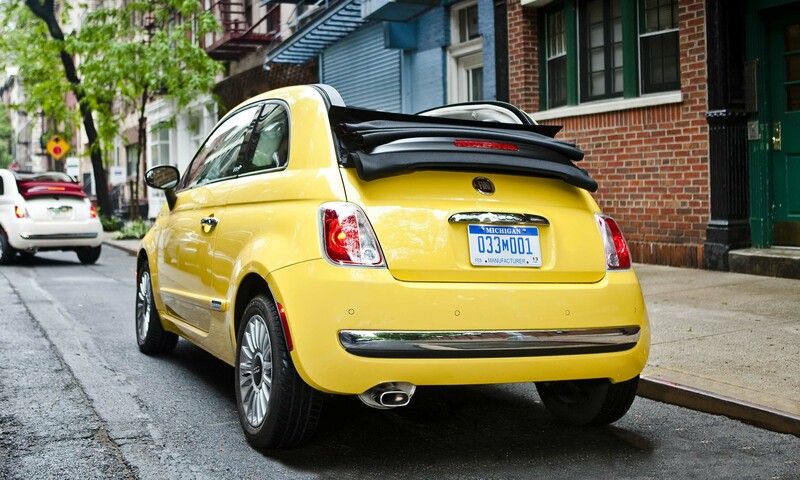 The 500c is the convertible version of Fiat’s subcompact 500, which combines Italian styling with efficiency and technology and features a dual-layer power cloth top complete with wind deflector and an integrated rear spoiler. The 500C comes in three versions: Pop, Lounge and Abarth. Options are no longer grouped in packages so owners can mix and match to personalize their open-air ride. The Fiat 500c is powered by a 101-horsepower turbocharged 1.4-liter MultiAir engine with a 5-speed manual transmission or a 6-speed automatic. The 500c Abarth is powered by a 160-horsepower version of the same engine and transmission choices. Fifteen exterior colors and nine interior color combinations are offered. The redesigned smart fortwo cabrio arrived in the U.S. last summer, adopting the design of the fortwo coupe. The soft-top offers three different configurations and can be fully opened in 12 seconds at any vehicle speed. 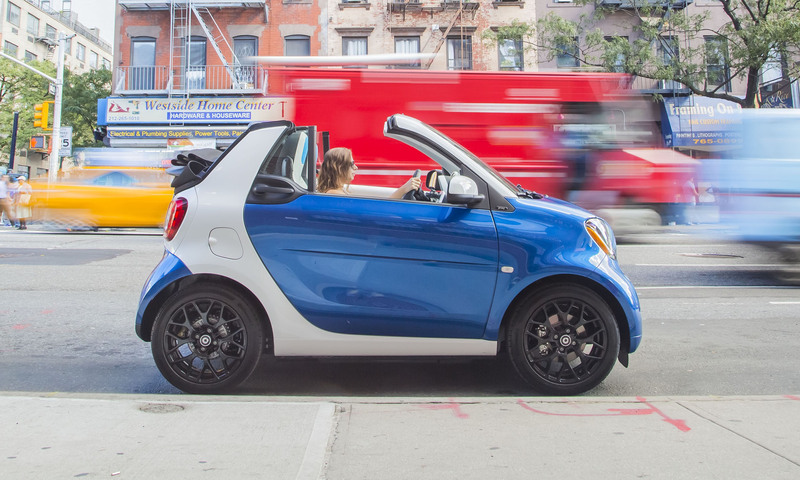 For 2017 smart adds the fortwo electric drive cabriolet, making the fortwo the only electric cabrio in the market. The electric motor produces 80 horsepower and 118 lb-ft or torque with a range of 99 miles when fully charged; it can be recharged in 2.5 hours via an onboard charger. The fortwo cabrio is also offered with an 89-horsepower 3-cylinder engine combined with either a 5-speed manual transmission or a twinamic dual-clutch unit. Although not typically considered a convertible, the Jeep Wrangler’s top does pop off this iconic go-anywhere 4X4. 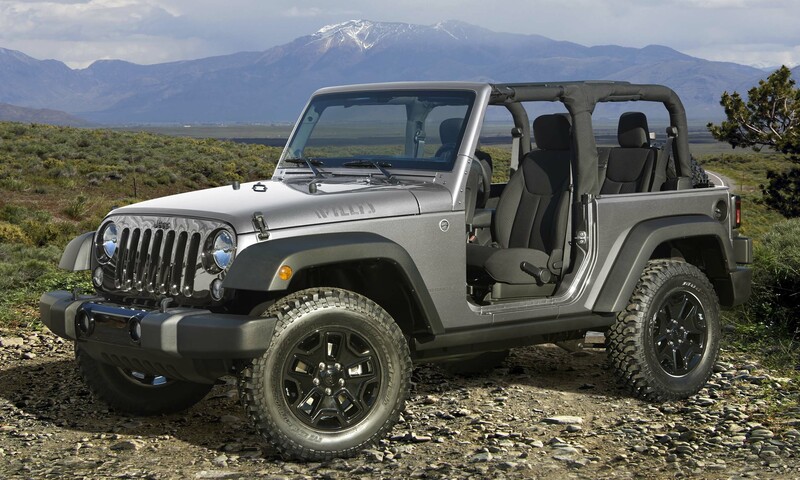 In fact, Wrangler’s doors can also be removed and the windshield folded down for the ultimate in open-air motoring. Available as the classic 2-door or larger 4-door Unlimited, the Wrangler comes in Sport, Sport S, Sahara and Rubicon trims. All Wranglers are powered by FCA’s 3.6-liter Pentastar V6 engine putting out 285 horsepower and plenty of low-end torque — a necessity for extreme off-roading. For 2017 Jeep adds the Wrangler Rubicon Recon package for more off-road capability via a stronger front axle, heavy-duty cast differential covers and shortened rock rails to accommodate up to 35-inch tires. Designed as a modern interpretation of Volkswagen’s most iconic model, the New Beetle joined the lineup for 1998. 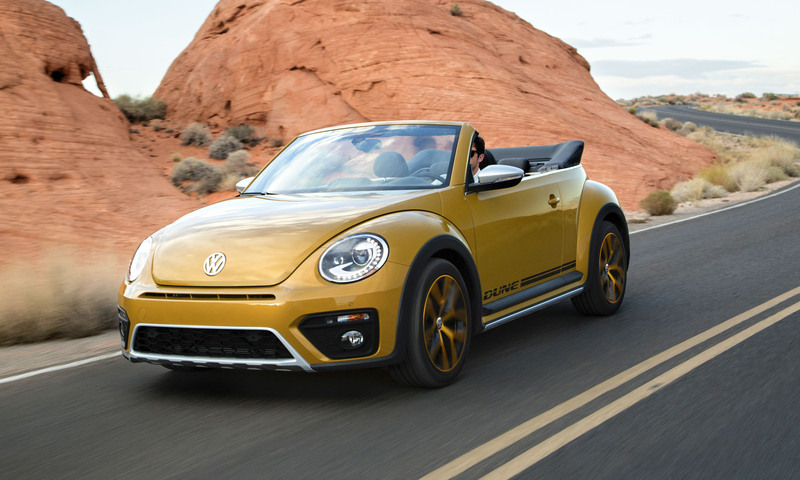 Redesigned for the 2013 model year, the Beetle continues to offer a convertible powered by a 170-horsepower 1.8-liter turbocharged 4-cylinder engine. The 2017 Beetle Convertible 1.8T gets a revised exterior with more aggressive front and rear bumpers with chrome accents, and the limited-edition Convertible #PinkBeetle and the Convertible 1.8T Dune also join the lineup. The pop-top #PinkBeetle is finished in Fresh Fuscia Metallic with gloss black mirrors, black running boards and 18-inch multi-spoke “Twister” wheels. The open-top 1.8T Dune is inspired by classic Baja Bugs with new bumpers, side moldings, wheels and a raised ride height. 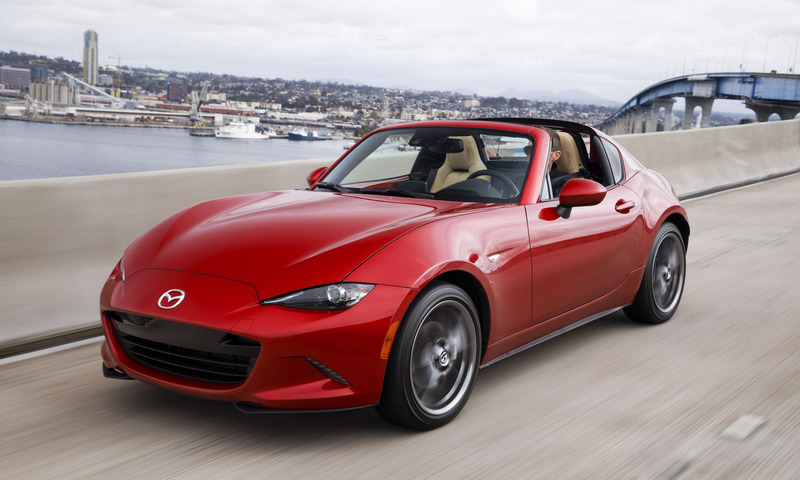 The most successful convertible of all time, the fourth-generation Mazda MX-5 Miata went on sale in summer 2015. Starting at $31,555, the MX-5 RF joins the lineup for 2017 — a retractable fastback with a power-folding hardtop that can open or close in just 13 seconds. The 2017 MX-5 incorporates SKYACTIV technology for improved performance and more efficiency, and adopts the KODO—Soul of Motion design to bring a modern look to the classic roadster. The MX-5 is approximately 150 pounds lighter than its predecessor, making it lightweight, nimble and fun to drive. The 2017 MX-5 is powered by a 155-horsepower SKYACTIV- G 2.0-liter engine combined with a standard SKYACTIV-MT 6-speed manual transmission. 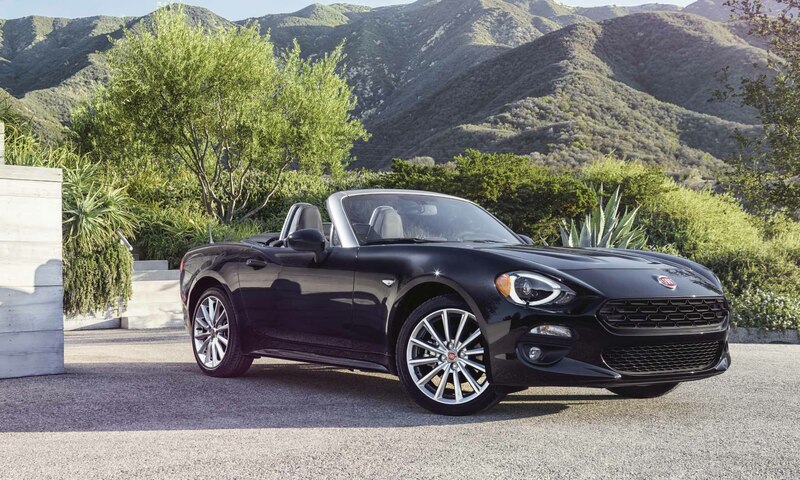 The 2017 Fiat 124 Spider arrived on U.S. shores last July, marking its return after a 30-year absence. The result of a collaboration between Fiat and Mazda, the 2017 Fiat 124 Spider is based on the Mazda MX-5 Miata but with Italian styling and Fiat drivetrain, suspension and tuning. The 124 Spider was designed in Turin, Italy, and takes styling cues from the original 124 Spider, including its hexagonal upper grille, power domes on the hood and sharp horizontal taillights. The soft-top can be manually operated from the driver’s seat and stows behind the seats without a tonneau cover. The rear-wheel-drive 124 Spider is available in Classica, Lusso and Abarth versions, powered by Fiat’s 1.4-liter MultiAir Turbo 4-cylinder engine that produces 160 horsepower (164 in Abarth) and 184 lb-ft of torque, combined with a 6-speed manual or automatic transmission. The Abarth also adds a host of additional sporty interior and exterior features. 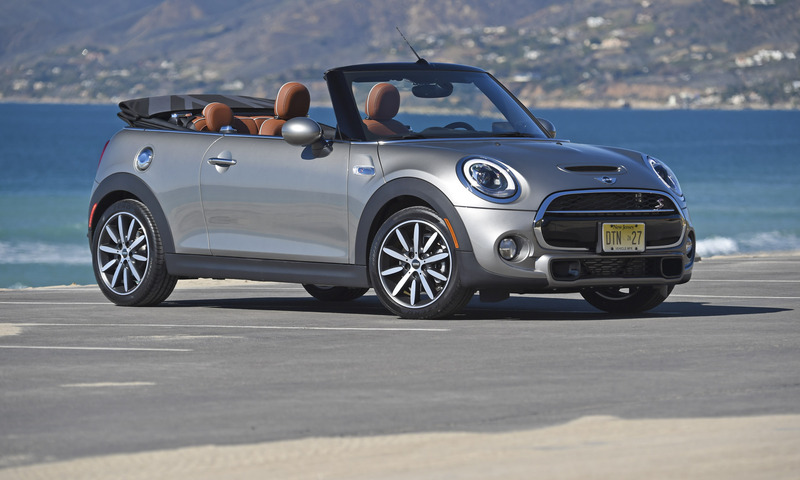 Redesigned for the 2016 model year, the base MINI Convertible is powered by a turbocharged MINI TwinPower 1.5-liter engine 3-cylinder engine that produces 134 horsepower and 162 lb-ft of torque, while the Cooper S is powered by a turbocharged TwinPower 2.0-liter engine that produces 189 horsepower and 207 lb-ft of torque. A 6-speed manual transmission is standard with a 6-speed Steptronic automatic transmission optional. The MINI John Cooper Works Convertible joined the lineup last year as the fastest, most powerful convertible ever from MINI, producing 228 horsepower and 236 lb-ft of torque. The JCW also includes a sport exhaust, sport suspension tuning and aerodynamic upgrades. The convertibles feature an “Always Open Timer” that calculates the number of hours driven with the top down. 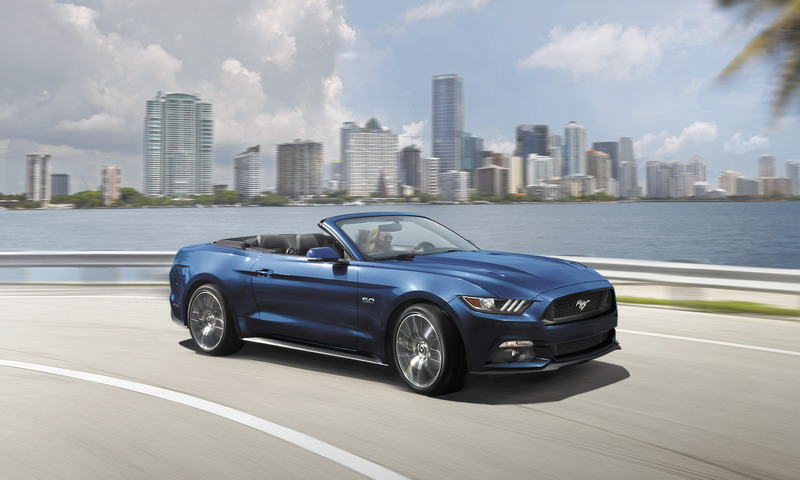 The latest-generation Mustang Convertible debuted for 2015 with a lower, wider stance; a lower roof height; wider rear fenders and a wider track. It features a multilayer insulated soft-top that lowers twice as fast as the previous model and has a sleeker profile when folded. The 2017 Mustang Convertible is offered with three different engine choices — a standard V6 and two performance options: a turbocharged EcoBoost four cylinder and a 5.0-liter V8. 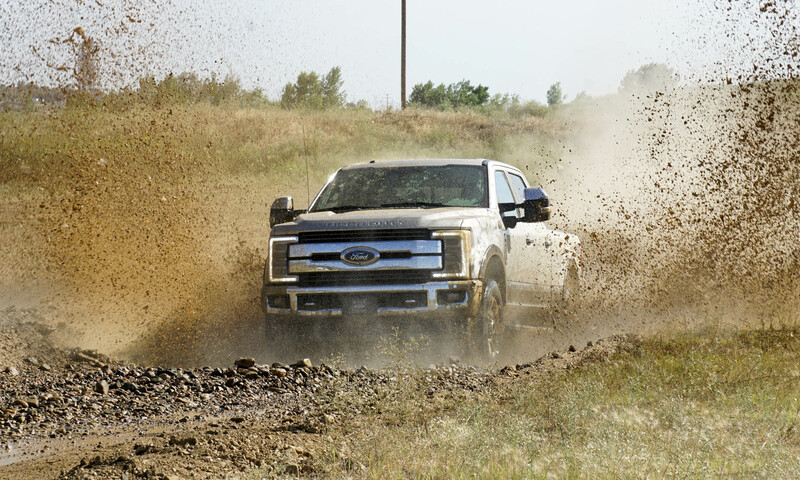 The 3.7-liter V6 generates 300 horsepower and the 2.3-liter EcoBoost produces 310 ponies. The GT is powered by a 5.0-liter V8 engine that produces 435 horsepower and 400 lb-ft of torque. The 2018 Mustang Coupe debuted in January and is scheduled to go on sale in fall 2017, but the new Mustang Convertible has not been shown. For 2017 the Chevrolet Camaro celebrates the golden anniversary of its introduction in 1967 with a 50th Anniversary addition and a “FIFTY” badge on the steering wheel of all models. 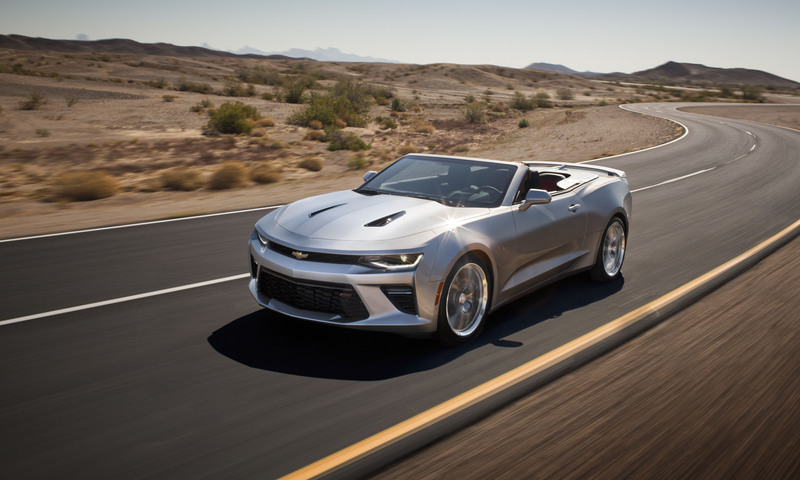 The Camaro is offered in five different trim levels: LT (1LT and 2LT), SS (1SS and 2SS) and ZL1, and all are available as a convertible. The convertible features a multi-layer soft-top that mimics the shape of the coupe, with a hard tonneau that covers the roof when stowed. The fully-automatic electro-hydraulic power roof system can be opened or closed at speeds up to 30 mph. 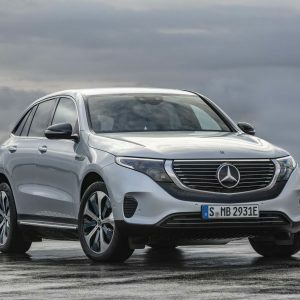 A new 275-horsepower 2.0-liter turbocharged four cylinder is the standard engine for LT, with a new direct-injected 335-horsepower 3.6-liter V6 engine optional. The SS is powered by the 455-horsepower 6.2-liter LT1 small-block V8 engine introduced on the Corvette. The ZL1 is powered by the LT4 supercharged 6.2-liter V8 producing 650 horsepower combined a 6-speed manual or a 10-speed automatic. 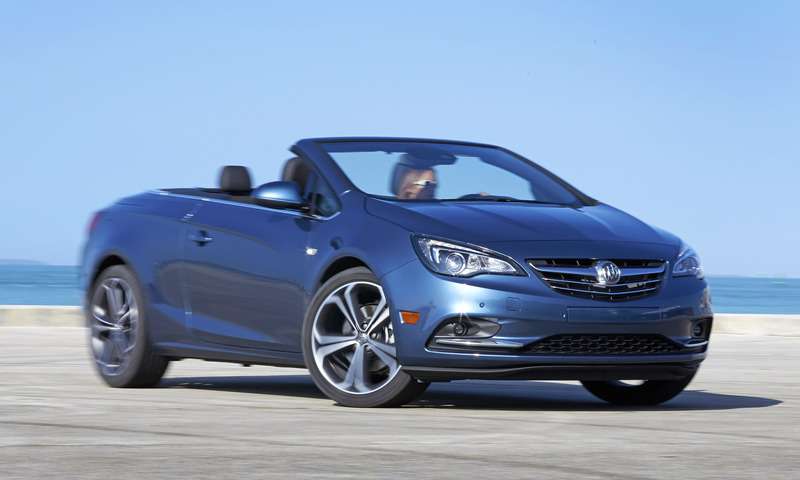 Cascada is an all-new 2+2 convertible that joined the Buick lineup as a 2016 model. Cascada features HiPer Strut front suspension based on a MacPherson strut design, and a standard 200-horsepower turbocharged 1.6-liter engine combined with a 6-speed automatic transmission. The power soft-top includes thermal and acoustic insulation and can be lowered in 17 seconds at speed up to 31 mph. 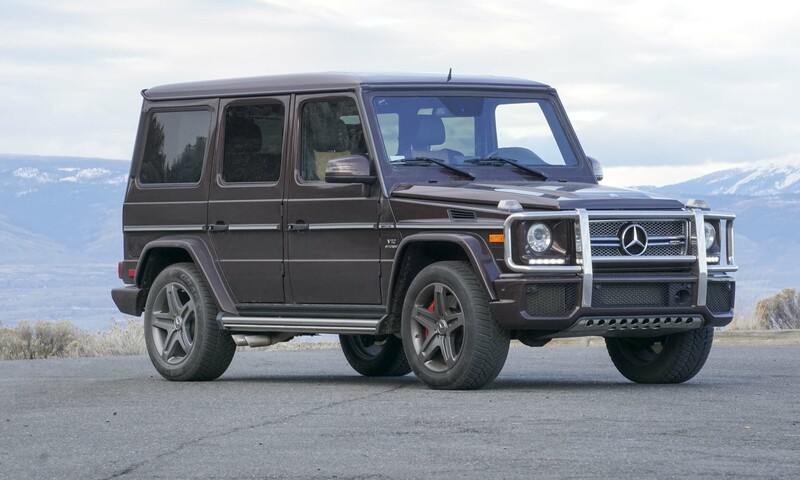 Standard equipment includes leather seating, heated front seats, a heated leather-wrapped steering wheel, OnStar 4G LTE with Wi-Fi hotspot and HID articulated headlights. For 2017 the Cascada Sport Touring joins the lineup with True Blue Metallic exterior paint, Sterling Silver 20-inch wheels and a flat-bottom sport steering wheel. 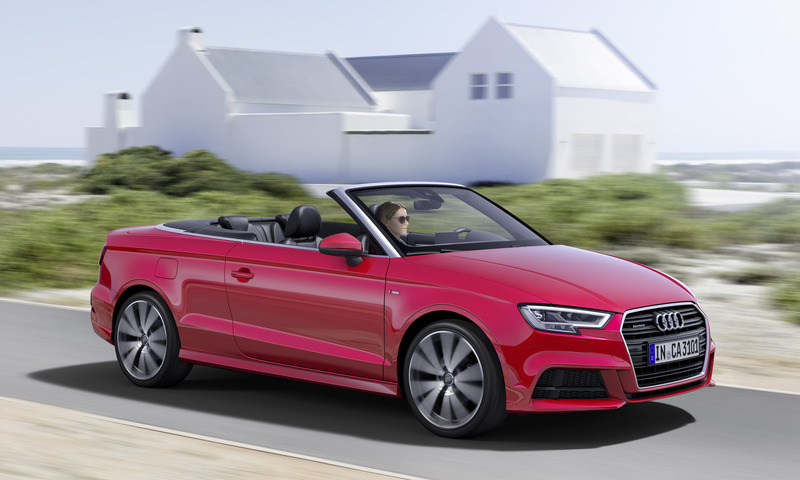 When the Audi A3 was redesigned for 2015, the open-top cabriolet entered the U.S. market, sporting a power-folding cloth top and available Audi quattro all-wheel drive. The A3 Cabriolet continues to be powered by a turbocharged 2.0 TFSI that produces 220 horsepower and 258 lb-ft of torque, mated to an S Tronic 6-speed Dual-Clutch automatic transmission. The 2017 Audi A3 Cabriolet receives an exterior update with a new headlight design, new front fascia, wider high-gloss Singleframe grille, a new rear bumper and new wheel designs. Inside, the Audi virtual cockpit and updated MMI software are available. Standard equipment includes leather seating surfaces, Audi Xenon plus headlights, LED daytime running lights, LED taillights with available dynamic turn signals and dual-zone automatic climate control. 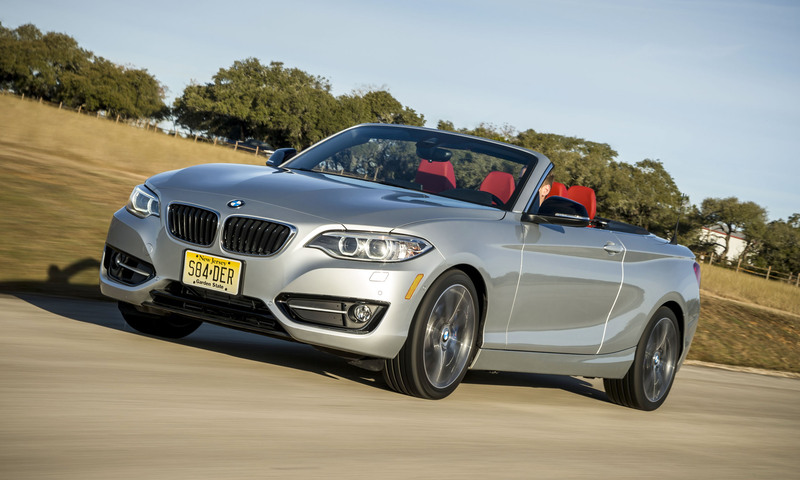 The 2017 BMW 2 Series receives the latest BMW TwinPower turbocharged 4-cylinder and 6-cylinder inline engines for the 230i Convertible and the M240i Convertible. The 230i is powered by a smoother, more efficient and more powerful 2.0-liter TwinPower Turbo 4-cylinder engine that produces 248 horsepower and 258 lb-ft of torque. The M240i is powered by an M Performance TwinPower Turbo inline 6-cylinder engine that produces 335 horsepower and 369 lb-ft of torque — an increase of 15 horsepower and 39 lb-ft of torque compared to the previous model. Both the 230i and M240i are available with a standard 8-speed Steptronic sport automatic transmission, available xDrive all-wheel drive and an available 6-speed manual with rear-wheel drive. The 2018 2 Series goes on sale in July 2017. The 2017 Nissan 370Z Roadster is the open-top version of Nissan’s 2-seat sports car, designed to create a sleek silhouette that matches the styling of the 370Z coupe, whether the top is up or down. 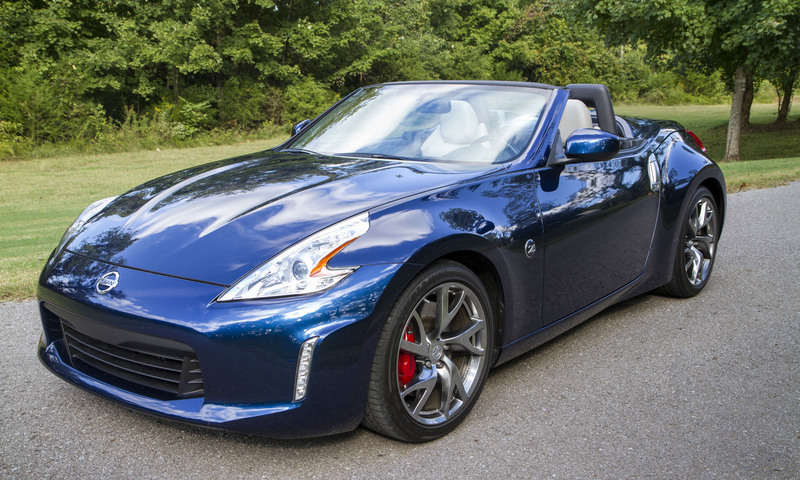 The 370Z Roadster boasts a 332-horsepower version of the Japanese automaker’s award-winning 3.7-liter V6 engine with a 7-speed automatic transmission with paddle shifters. The 370Z Touring Sport adds a standard 6-speed manual with SynchroRev Match and RAYS super lightweight forged aluminum-alloy wheels. The 350Z coupe joined the Nissan lineup for 2003 — seven years after the last 300ZX — as a modern version of the original 240Z. The Roadster joined for the 2004 model year and the name changed to 370Z for the 2013 model year with the introduction of the 3.7-liter engine. All-new for 2016 with more focus on the elements of a true sports car, the 2-seat TT Roadster’s design ties it closer to the R8 front fascia with a broader, flatter Singleframe grille and standard LED headlights, while retaining signature elements from the original design including the exaggerated wheel arches that push into the hood cutline, round exhaust tips and prominent gas filler door. For 2017 the TT Roadster adds a standard rearview camera and power-folding, auto-dimming heated exterior mirrors. 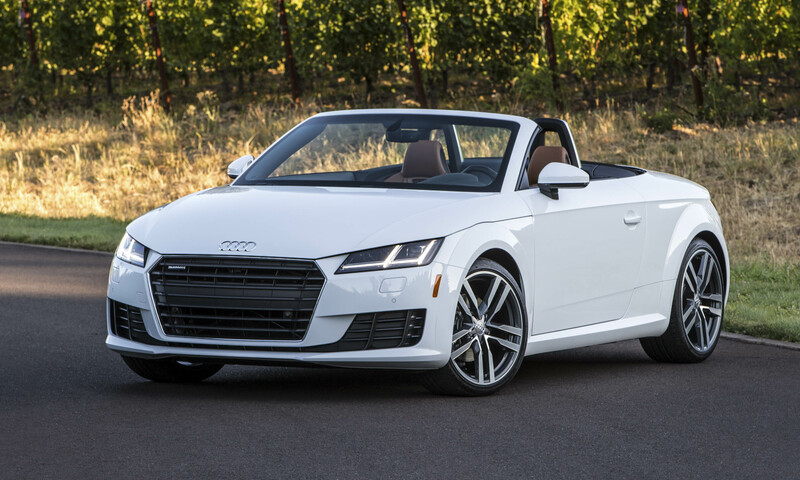 The TT Roadster is powered by a turbocharged 2.0-liter TFSI 4-cylinder engine that produces 220 horsepower and 258 lb-ft of torque, combined with a 6-speed S tronic dual-clutch transmission with quattro all-wheel drive. 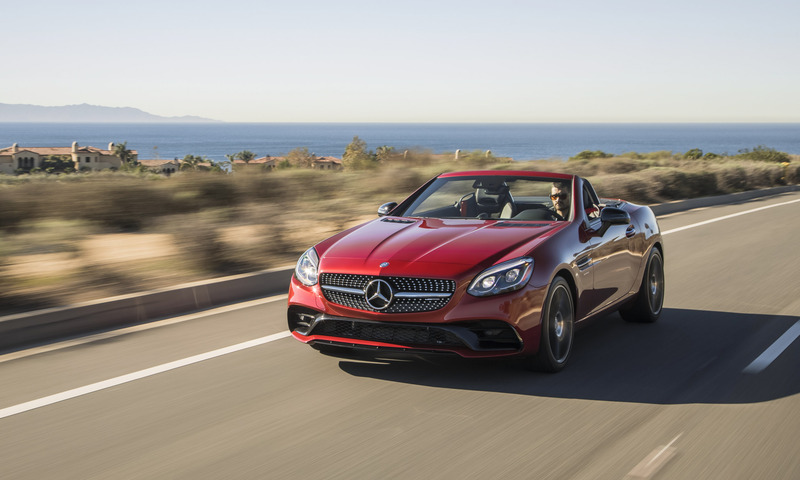 The 2017 Mercedes-Benz SLC 2-seat roadster with its retractable hardtop hit the market in spring of 2016, replacing the SLK in the model lineup. The SLC300 is powered by a turbocharged 2.0-liter engine that produces 241 horsepower and 273 lb-ft of torque; the Mercedes-AMG SLC43 gets power from an AMG 3.0-liter V6 biturbo that produces 362 horsepower and 384 lb-ft of torque. The 9G-TRONIC 9-speed automatic transmission is standard for both versions. For 2017, two special editions are offered: the SLC300 RedArt Edition, finished in Selenite Grey Metallic with Gloss Red exterior accents and 18-inch twin 5-spoke wheels; and the AMG SLC43 Performance Studio RedArt, finished in designo Selenite Grey Magno with red accents and 18-inch 10-spoke AMG light-alloy wheels. 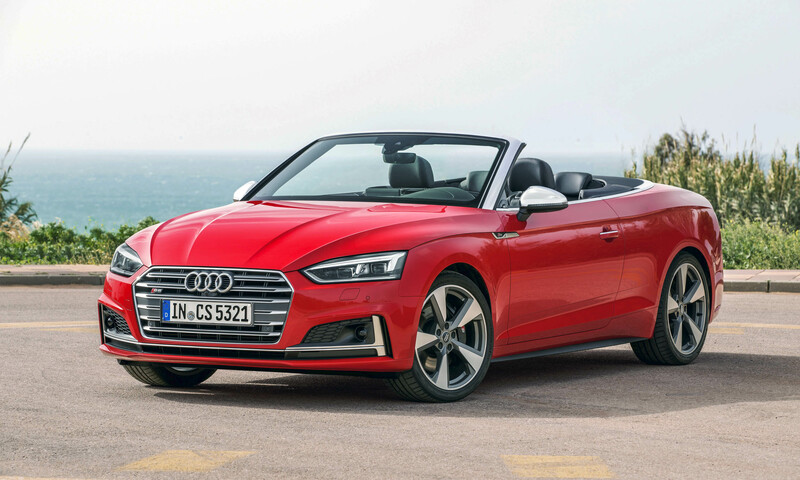 The 4-seat convertible version of Audi’s beautiful A5 Coupe, the redesigned 2018 Audi A5 Cabriolet features a wider, flatter Singleframe grille; a lower, longer hood line and a more pronounced wave design shoulder line. The cloth soft-top can be lowered in just 15 seconds at speed up to 31 mph and includes a new one-touch opening function. When opened, the top folds into three layers stows beneath the trunk space to provide the most cargo space possible. Inside, the A5 Cabriolet offers the same advanced infotainment systems introduced in the coupe and sportback, including the Audi virtual cockpit. Powering the A5 is a 2.0-liter 4-cylinder engine that produces 252 horsepower and 273 lb-ft of torque, teamed with a 7-speed dual-clutch transmission and quattro all-wheel drive. 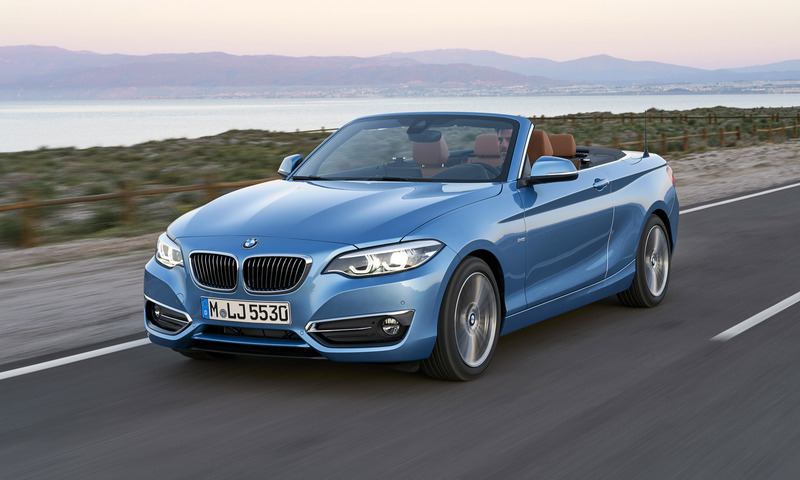 BMW’s 4-seat convertible that replaced the 3 Series Convertible for the 2014 model year, the 4 Series has a wider stance than the 3 Series, as well as a longer wheelbase and a 3-piece retractable hardtop. The new 2018 4 Series (available since March 2017) features standard bi-LED headlights with optional adaptive full-LED headlights, LED fog lights, LED taillights, a new lower front air intake, a new rear apron and four new wheel designs for each of the four Advantage, Sport, Luxury and M Sport packages. 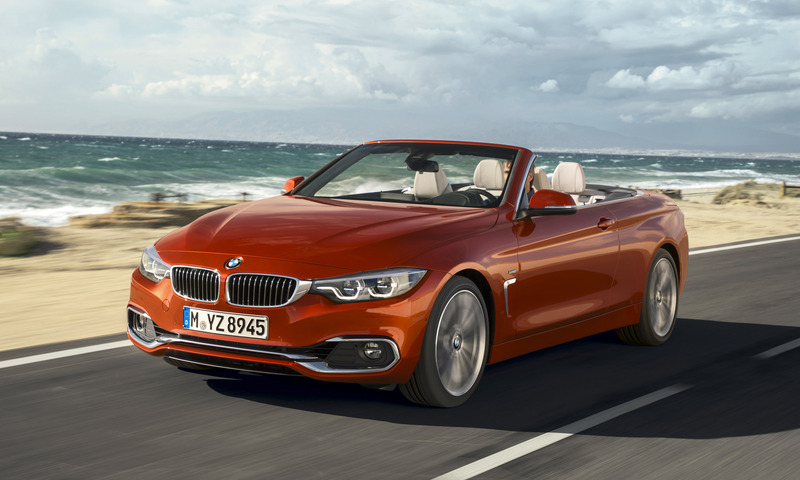 The 430i Convertible is powered by the TwinPower Turbo 2.0-liter 4-cylinder engine producing 248 horsepower, and the 440i Convertible gets power from a 320-horsepower TwinPower Turbo 3.0-liter inline 6-cylinder unit. Both offer a standard 8-speed sport automatic transmission, and BMW’s xDrive all-wheel drive is optional. The 2017 Mercedes-Benz C-Class Cabriolet is the first time an open-top C-Class has ever been offered with five different versions: C300, C300 4MATIC, AMG C43 4MATIC, AMG C63 and AMG C63 S. The C300 is powered by a 241-horsepower turbocharged 2.0-liter four cylinder with a 9-speed automatic transmission. The AMG C43 4MATIC is powered by a362-horsepower 3.0-liter V6 biturbo combined with the 9G-TRONIC automatic transmission and AMG Performance 4MATIC all-wheel drive. The AMG C63 and C63 S are both powered by an AMG V8 biturbo engine with 469 horsepower for the C63 and 503 for the C63 S, mated with the 7-speed AMG SPEEDSHIFT MCT transmission. The C-Class Cabriolet design follows that of the Coupe, with a diamond grille, standard LED headlights, a long hood, high beltline and flat LED taillights. The power acoustic cloth soft-top mimics the profile of the coupe and can be lowered in 20-seconds at speeds up to 31 mph. The tightly-stretch soft-top includes a glass rear window and stows in the trunk with an integrated cover for a clean finish when lowered. Porsche’s mid-engine, 2-seat roadster gets redesigned for the 2017 model year, and the name gets changed to 718 Boxster. The German automaker has a rich history of sports car racing — in 1950s and ‘60s the company campaigned the legendary 718 lightweight mid-engine sports car. In the spirit of that original, Porsche introduces the 718 Boxster. This updated roadster is available as the 718 Boxster or 718 Boxster S. A newly-developed 2.0-liter turbocharged engine produces 300 horsepower in the 718 Boxster, and the S upgrades to a 2.5-liter turbo producing 350 horsepower. The models feature new chassis tuning and stronger brakes, which should provide great fun on the road or track. The Boxster debuted as a 1997 model at a lower price than the rear-engine 911, also powered by horizontally-opposed 6-cylinder engine. The seventh-generation Corvette Stingray debuted as a 2014 model, bringing back the Stingray name in both convertible and coupe versions. The Stingray is powered by a LT1 small block 6.2-liter V8 engine producing 455 horsepower and 460 lb-ft of torque. When combined with a new 7-speed manual transmission with Active Rev Match technology, the Corvette Stingray achieves EPA-estimated fuel economy of 17 mpg city / 29 mpg highway. Last year the ZO6 returned, also available as a convertible, powered by a 650-horsepower supercharged 6.2-liter V8 engine. A new 8-speed paddle-shift automatic transmission is available for all models including the Z06, and is designed to improve both performance and efficiency. 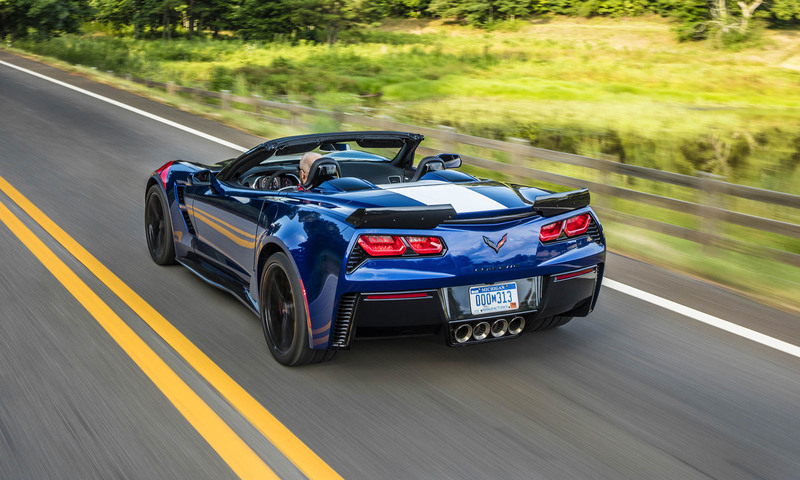 For 2017 the Corvette Grand Sport returns, also offered as a convertible, with a track-tuned aerodynamic package, wider fenders, Brembo brakes, magnetic ride control suspension and LT1 V8 engine rated at 460 horsepower with dry-sump oil system and active exhaust. 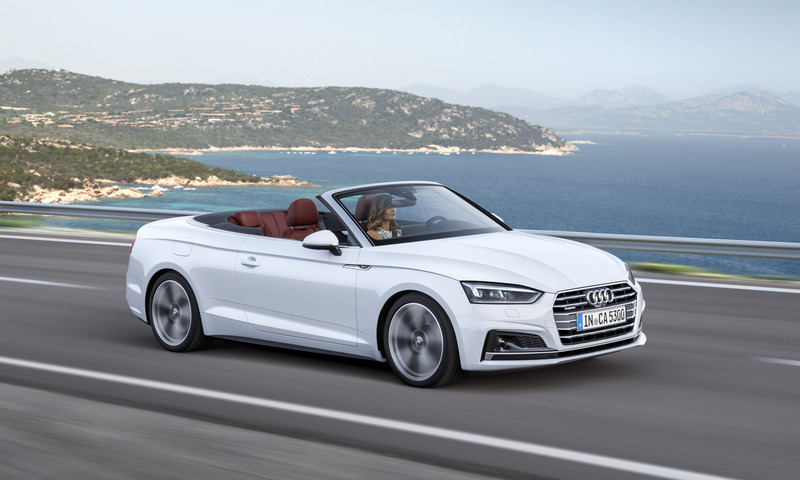 The high-performance version of Audi’s A5 Cabriolet, the S5 Cabriolet gets power from a reengineered V6 that produces 354 horsepower and 369 lb-ft of torque, combined with an 8-speed automatic transmission; the S5 accelerates from zero to 60 mph in less than 5 seconds. The standard Audi quattro all-wheel-drive system includes a self-locking center differential, basic 40:60 front/rear torque split and wheel-selective torque control. Optional dynamic steering adjusts the variable steering ratio based on vehicle speed and the Audi drive select setting. The available Audi virtual cockpit features a 12.3-inch display that delivers vibrant color with NVIDIA quad core processing power via three display modes: Classic, Infotainment and Sport. 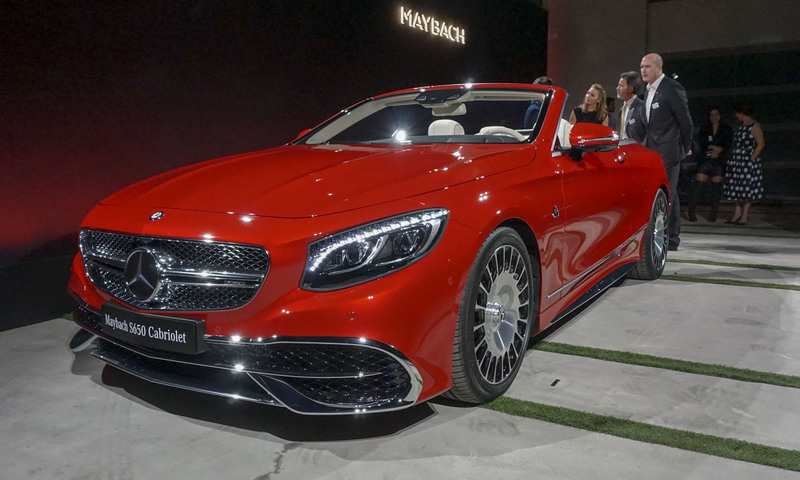 The all-new 2018 Mercedes-Benz E-Class Cabriolet debuted at the Geneva Motor Show in March and is scheduled to go on sale in the U.S. later in 2017. 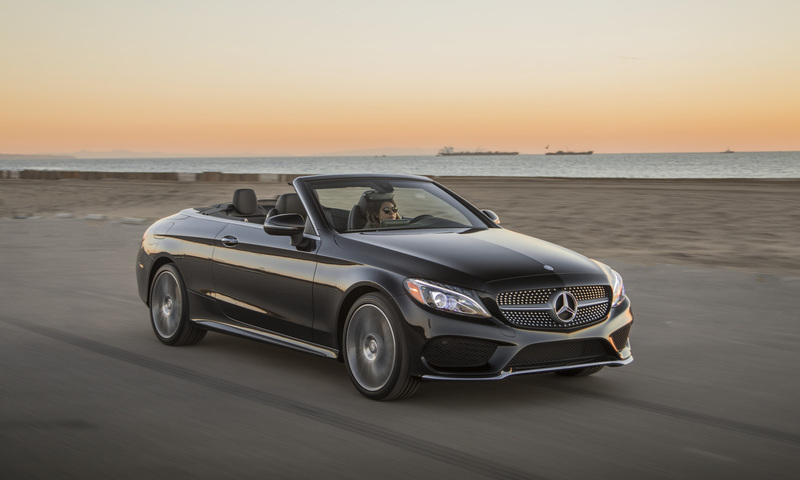 The E-Class Cabriolet uses a classic soft-top rather than a heavier, more expensive hardtop. The multilayered, insulated top keeps the interior quiet, even when driving at high speeds. 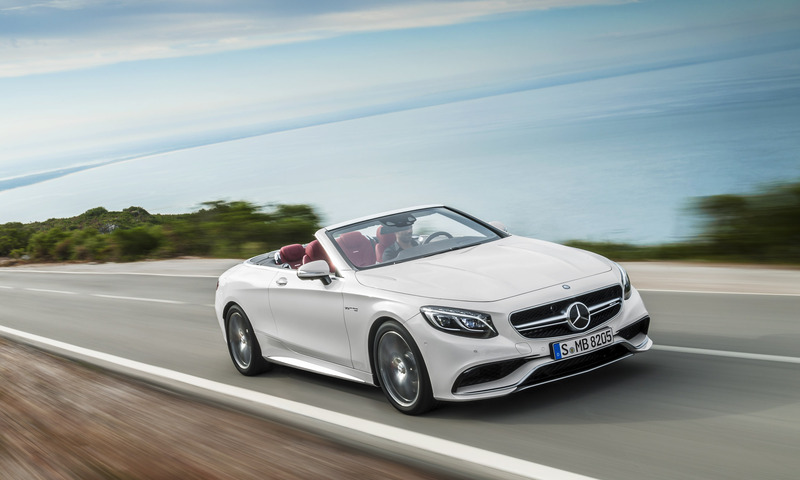 The new E-Class Cab will be offered with a powerful yet efficient 3.0-liter biturbo V6 engine, and for the first time the convertible will be available with 4Matic all-wheel drive. The top can be raised or lowered in 20 seconds at speeds up to 30 mph, and with the top raised the cabriolet has a similar silhouette to the E-Class Coupe. The E-Class also features the signature Mercedes-Benz AIRSCARF, which circulates warm air near the neck when ambient temperatures are low. The 2018 Jaguar F-TYPE debuted at the New York Auto Show with a new look, new powertrain options and new standard technology. For the first time, the F-TYPE will be offered with a 4-cylinder engine: a 296-horsepower turbocharged 2.0-liter teamed with the 8-speed Quickshift transmission. 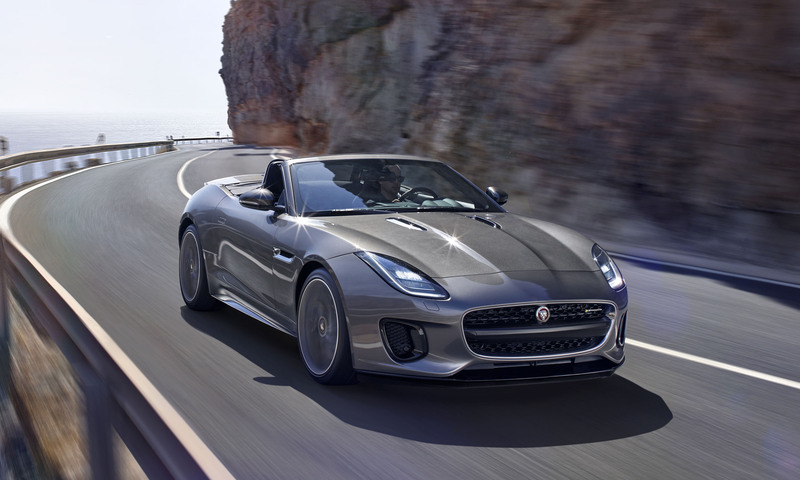 Peak torque is produced as low as 1500 rpm, helping the 4-cylinder F-TYPE reach 60 mph in 5.4 seconds. The F-TYPE continues to be available with supercharged V6 and V8 engine options, including the 575-horsepower F-TYPE SVR. Design updates for 2018 include new full-LED headlights, a new front bumper and new air intakes. A new F-TYPE 400 SPORT special edition is offered for the 2018 model year only, powered by a 400-horse version of the supercharged 3.0-liter V6. 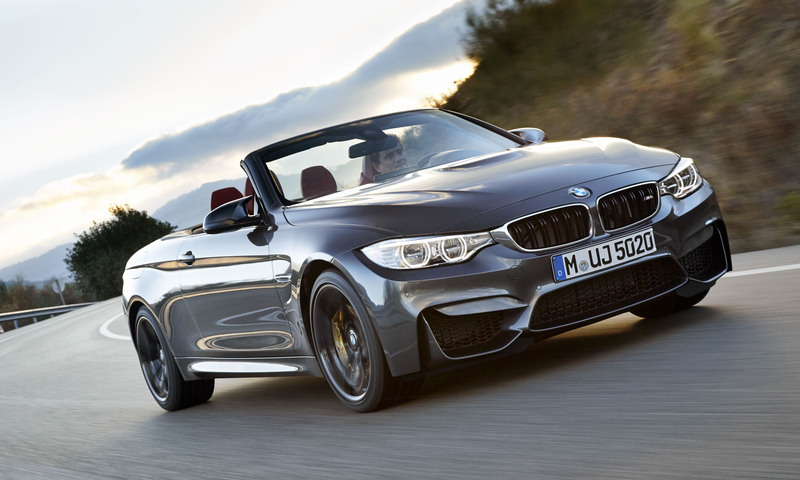 The high-performance version of the 4 Series, the M4 Convertible joined the M4 Coupe in 2015 for the U.S. market. For 2017 Adaptive M Suspension is standard for the M4 Cabriolet, iDrive 5.0 is added, the Executive Package now includes wireless charging with a Wi-Fi hotspot and the optional Individual Extended Merino Leather now includes a leather-covered dashboard. The M4 is powered by a BMW M TwinPower Turbo 3.0-liter inline 6-cylinder engine that produces 425 horsepower and 406 lb-ft of torque from 1850–5500 rpm, combined with a standard 6-speed manual transmission or an optional 7-speed M Double Clutch Transmission and standard Active M differential. The aggressive design features aluminum front fenders and hood for weight savings, and the M4 Convertible shares the folding hardtop with the 4 Series Convertible. 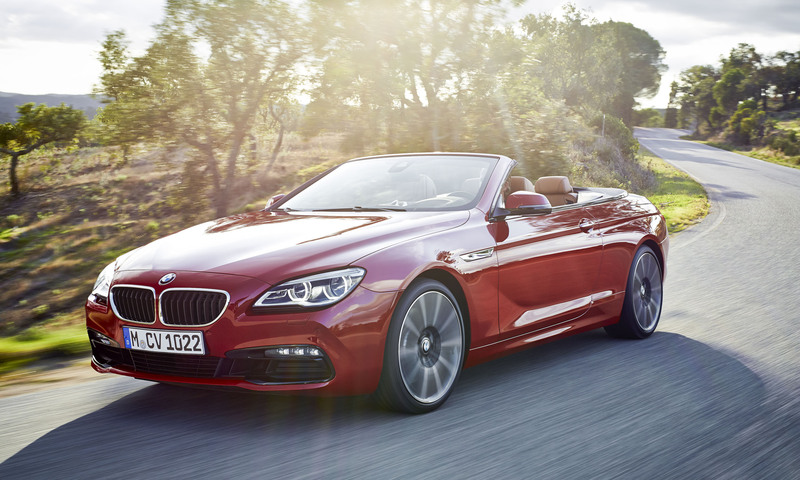 The BMW 6 Series Convertible was updated for 2015 with a new front-end design and standard Adaptive Full-LED headlights. For 2018 the M Sport Package offers an exclusive Carbon Fiber trim package previously available on the M6, new Sonic Speed Blue metallic paint and new 20-inch bi-color M wheels. The 6 Series fabric soft-top has fins that extend toward the rear fenders and a vertical rear window that opens separately. The 650i is powered by the BMW TwinPower Turbo V8 that produces 445 horsepower and 480 lb-ft of torque, combined with an 8-speed Steptronic sport automatic transmission. The 640i is equipped with BMW’s TwinPower Turbo inline 6-cylinder engine that produces 315 horsepower and 332 lb-ft of torque, also mated to an 8-speed Steptronic sport automatic transmission. Both 640i and 650i are available with xDrive all-wheel drive. One of the most iconic convertible of all time, the Mercedes-Benz SL roadster has a rich history dating back to the 300 SL of the 1950s. On sale in spring 2016, the new 2017 Mercedes-Benz SL receives a revised front end, more powerful engines, a new 9-speed automatic transmission and available Active Body Control with curve tilting function. The new design features a unique diamond grille that extends downward, large lower air inlets and standard LED headlights. The 2017 SL is offered as the SL450 and SL550, as well as the Mercedes-AMG SL63 and SL65. The SL450 is powered by a biturbo 3.0-liter V6 engine that produces 362 horsepower and 369 lb-ft of torque at 2000 rpm. 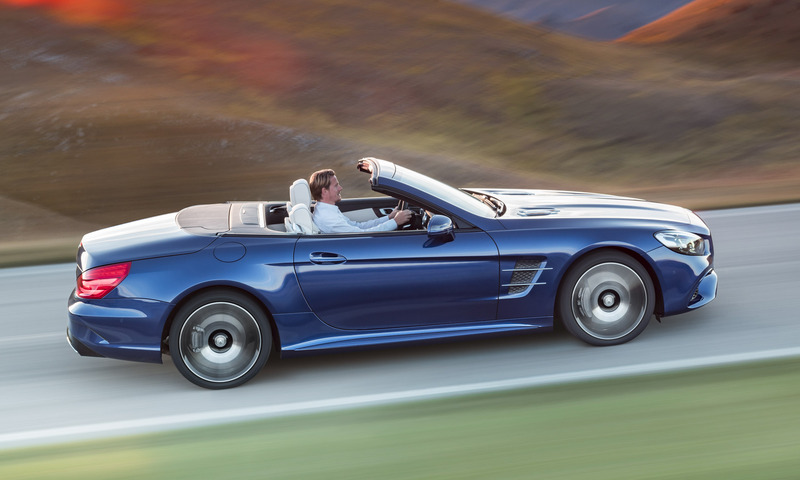 The SL550 receives a biturbo 4.7-liter V8 that produces 449 horsepower and 516 lb-ft of torque. The SL450 and SL550 use the 9G-TRONIC 9-speed transmission. The SL63 AMG is powered by a hand-built 5.5-liter AMG biturbo V8 that produces 577 horsepower and 664 lb-ft of torque; the SL65 AMG gets power from a hand-built 6.0-liter AMG biturbo V12 that produces 621 horsepower and 738 lb-ft of torque. One of the most iconic sports cars of all time, the Porsche 911 debuted in 1963 and continues today as a benchmark among sports cars. The 911 Cabriolet has been offered every year since 1983 and is redesigned for the 2017 model year; it is longer and lower with a wider front track than the previous model, with new features such as a new rear axle design, new electro-mechanical power steering, Porsche Torque Vectoring, and enhanced Porsche Active Suspension Management. 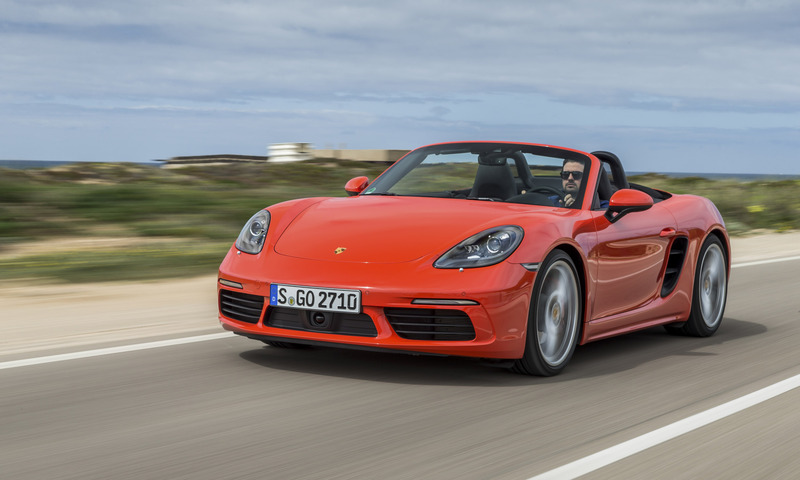 The new 911 Cabriolet is offered in eight different trim levels: Carrera, Carrera S, Carrera GTS, Carrera 4, Carrera 4S, Carrera 4 GTS, Turbo and Turbo S. The new Carrera Cabriolet and Carrera 4 Cabriolet are powered by a new 370-horsepower twin-turbo 3.0-liter horizontally-opposed 6-cylinder engine, and the Carrera S and Carrera 4S receive a 420-horsepower version of the twin-turbo 3.0-liter engine. The 2018 Carrera GTS and Carrera 4 GTS are powered by a 450-horsepower twin-turbo 3.0-liter engine. 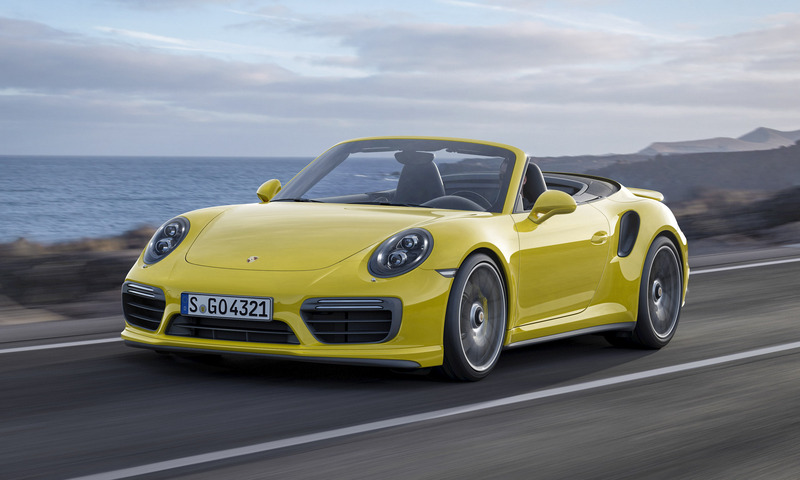 The 2017 911 Turbo Cabriolet has a 540-horsepower twin-turbo 3.8-liter, and the Turbo S Cabriolet receives a 580-horsepower version of the twin-turbo 3.8-liter engine. 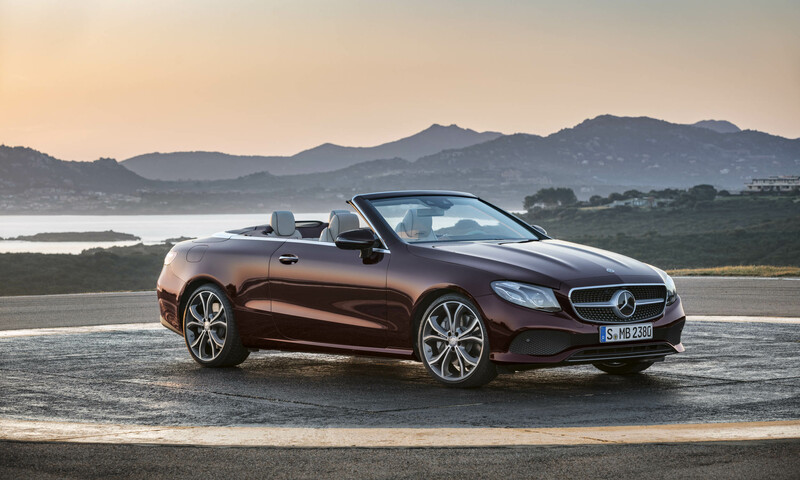 The first open-top 4-seat S-Class since 1971, the new Mercedes-Benz S-Class Cabriolet features all the technology of other S-Class models, as well as a complete system for top-down warmth and wind control. The sleek, elegant design makes for one of the most exclusive S-Class models ever, with a coupe-like profile when the soft-top is closed. The top can be lowered in 20 seconds at speeds up to 35 mph. Inside the new S-Class Cab, technological creature comforts include an enhanced automatic wind protection system called AIRCAP, the AIRSCARF neck-level heating system, heated armrests and heated front and rear seats. The intelligent climate control is fully automatic and the driver does not need to choose a different mode when the top is open or closed. The S550 Cabriolet is powered by a 4.7-liter biturbo V8 engine producing 449 horsepower and 516 lb-ft of torque. The high-performance Mercedes-AMG S 63 4MATIC Cabriolet is powered by the 585-horsepower AMG 5.5-liter V8 biturbo engine with AMG Performance 4MATIC all-wheel drive. For the ultimate in open-top motoring, the new Mercedes-AMG S65 Cabriolet adds to the Mercedes V12 lineup, powered by an AMG 6.0-liter V12 biturbo engine that produces 621 horsepower and 738 lb-ft of torque, combined with the AMG SPEEDSHIFT PLUS 7G-TRONIC transmission. The three-layer acoustic fabric soft-top is available in four colors and has a high-quality lining in Nappa leather and DINAMICA microfiber. 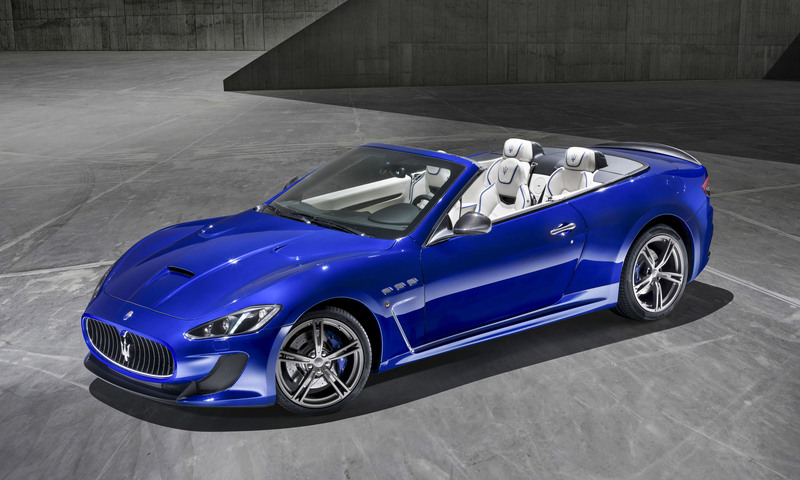 The open-top version of the GranTurismo, the Maserati GranCabrio gets motivation from a 450-horsepower 4.7-liter V8 engine. The GranCabrio Sport is the top performance trim of the GranCabrio line, featuring 460 horsepower, a 6-speed transmission that includes a faster shifting MC Auto Shift mode, and a more aggressive appearance. The GranCabrio Sport also includes a revised Skyhook active-suspension system and an upgraded brake package. The GranCabrio MC upgrades with a sportier, aggressive look while maintaining Maserati’s signature performance, handling and ride characteristics. 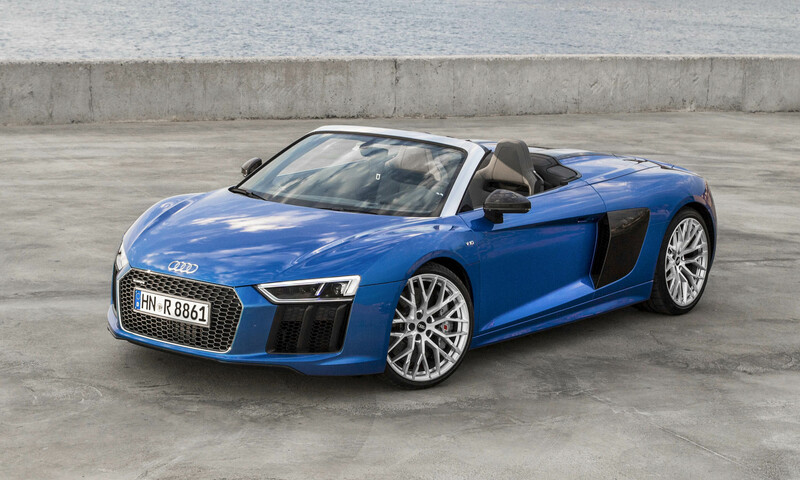 The new 2017 Audi R8 V10 Spyder is powered by the same normally-aspirated 5.2-liter V10 engine and 7-speed S-tronic dual-clutch transmission as the R8 V10 Coupe, producing 540 horsepower and 398 lb-ft of torque. While the R8 V10 Spyder offers the additional enjoyment of open-top driving, it will still sprint to 60 mph in just 3.5 seconds with a top track speed of 198 mph. Power gets directed to all four wheels via Audi’s legendary quattro all-wheel-drive system, which provides excellent traction even in adverse weather conditions. Slightly shorter in overall length but wider than its predecessor by about 1.4 inches, the new R8 V10 Spyder has a low, wide stance, further accentuated by a large honeycomb grille. Audi’s headlights provide a signature look at night, and laser lighting is available for maximum visibility and range — identified by a blue anodized strip in the headlights. The cloth top can be opened in 20 seconds at speeds up to 31 mph. 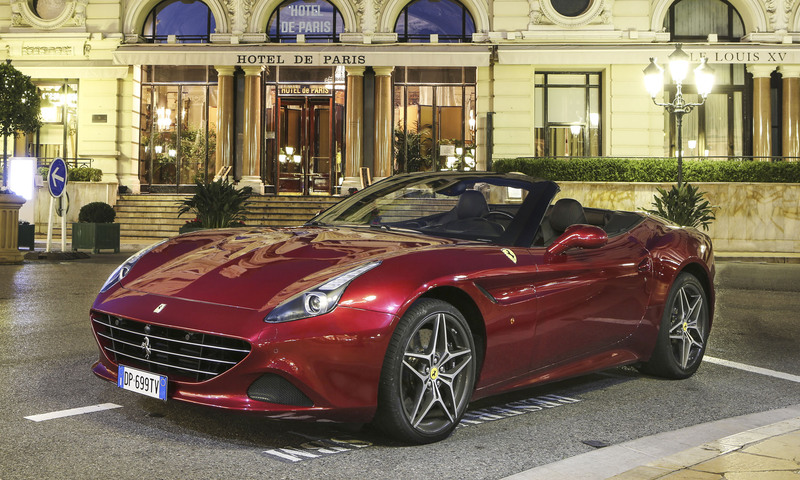 Ferrari’s front-engine, V8-powered California T has a power-retractable hardtop. The Ferrari California debuted as a 2009 model and was designed as a modern version of the Ferrari California Spyder of the late 1950s and early 1960s. The new California features design cues from the original car, such as the long hood, short decklid and hood scoop. The California was updated for 2015 with a new grille, headlights and hood without the scoop. 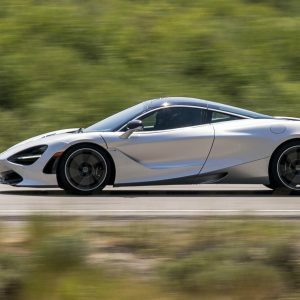 The name was changed to California T to reflect the new 3.9-liter twin-turbocharged V8 engine that produces 553 horsepower and 557 lb-ft of torque with a standard 7-speed manual transmission. A new Handling Speciale option has stiffer springs, new damper settings and a new exhaust system with two primary pipes and silencers; the exhaust note increases with engine speed. The Bentley Continental GT Convertible was updated for the 2016 model year with new exterior features, including a new front bumper, smaller grille, more pronounced fenders, front fender vents that incorporate a metallic “B” and front fender badges for the V8 S and W12 that match the badge of the GT Speed. At the rear, the trunk lid is more aerodynamic, the rear bumper is wider and a new diffuser gets added to the V8 S and Speed. The Continental GT Convertible continues to be offered in W12, V8, V8 S and Speed versions along with the addition of the Continental Supersports, powered by a new version of the W12 engine that produces 700 horsepower and 750 lb-ft of torque. 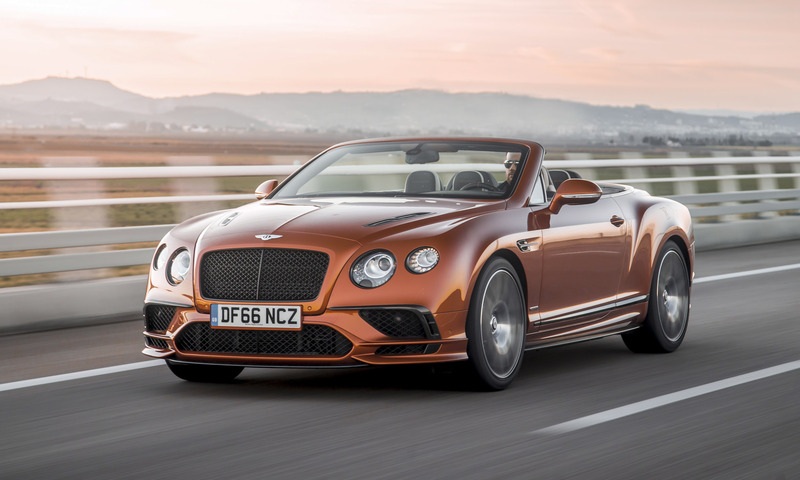 Bentley claims the Continental Supersports Convertible is the fastest 4-seat convertible in the world, capable of accelerating from zero to 60 mph in 3.7 seconds with a top track speed of 205 mph. The Ferrari 488 Spider is the open-top version of the 488 GTB, the latest iteration of Ferrari’s V8-powered mid-engine 2-seat sports car. Since the debut of the 308 GTB in the 1970s, Ferrari has offered a mid-engine V8 sports car and an open-top version since the targa-top 308 GTS. 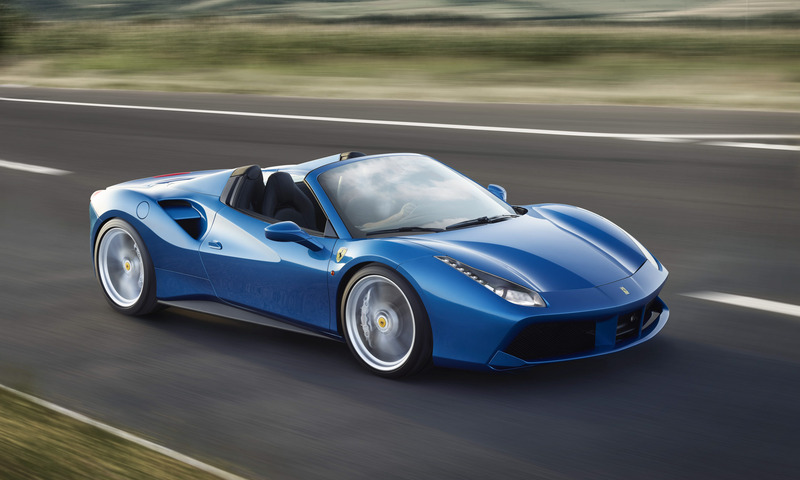 The 488 GTB and 488 Spider continue that tradition, powered by a twin-turbocharged 3.9-liter V8 engine that produces 660 horsepower and 560 lb-ft of torque combined with a 7-speed dual clutch transmission. The Spider’s power-retractable hardtop operates in 14 seconds, with two panels stowed behind the seats. The electric glass rear window can be placed in three positions with the top up or down. The 488 accelerates from zero to 62 mph in 3 seconds and reaches 124 mph in 8.7 seconds with a top speed over 200 mph. Driving dynamics are enhanced by F1-Trac traction control, E-Diff 3 electronic differential, SSC2 side slip angle control and Magnetorheological suspension control. The Lamborghini Huracan LP 610-4 Spyder is the open-top version of the Huracan with a lightweight soft-top for open-air driving. 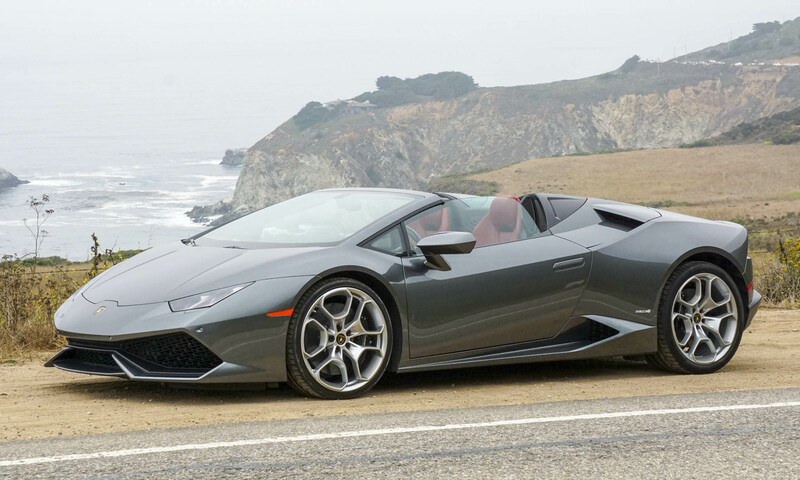 Powered by the same 610-horsepower 5.2-liter V10 engine as the coupe, the Huracan Spyder will accelerate from zero to 62 mph in 3.4 seconds and achieve a top speed of 201 mph. Power for the Spyder is delivered through a 7-speed dual-clutch transmission and a new electronically-controlled all-wheel-drive system. The cloth top opens in 17 seconds, and with the top stowed two fins start behind the seats and run toward the rear of the car to continue the roofline, maintaining the sleek shape and optimizing airflow through the engine compartment. 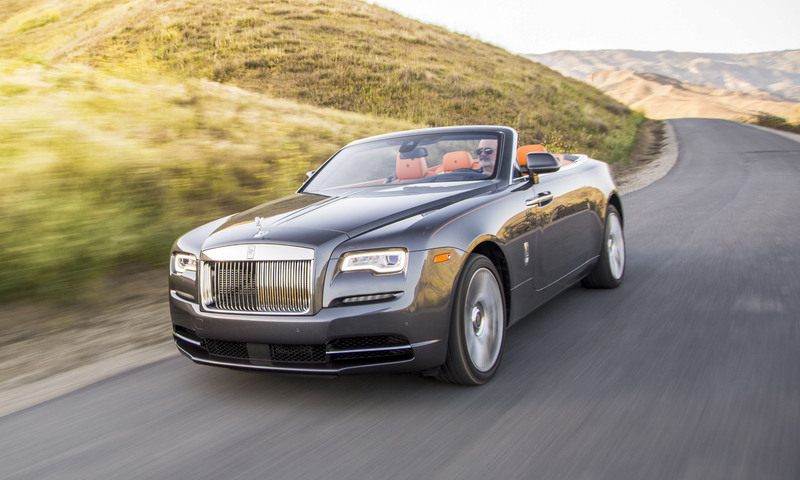 Dawn is the Rolls-Royce super-luxury 4-seat convertible that joined the lineup as the seventh-generation Phantom was phased out. 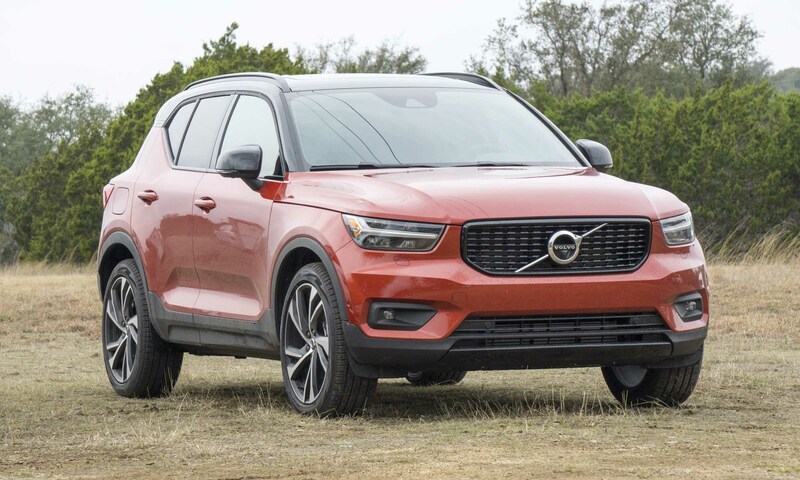 Dawn is offered as a single model without set trim levels, since nearly every car gets built to individual customer specifications that include tens of thousands of dollars in options. Dawn shares mechanical underpinnings with the Wraith Coupe, but is not simply a convertible Wraith; 80 percent of the body panels are unique. The lowered soft-top gets stowed beneath a wooden deck that flows down between the rear seats and throughout the cabin. Powered by Rolls-Royce’s twin-turbo 6.6-liter V12 engine producing 563 horsepower and 575 lb-ft of torque at 1500 rpm, Dawn is Rolls-Royce’s most powerful full 4-seat drophead offered to date. Inside, the Rolls-Royce Dawn offers an environment of exquisite materials meticulously handcrafted to create an unmatched luxury experience. The open-top version of Lamborghini’s most extreme high-performance exotic car, the Aventador LP 700-4 Roadster is powered by a 700-horsepower 6.5-liter V12 engine mounted longitudinally behind the driver. The Aventador delivers power to all four wheels through a 7-speed automated manual gearbox that features three manual shift modes and two automatic shift modes. The Aventador Roadster adds a power rear window, a wind deflector and an engine cover with sectioned hexagonal glass plates. The Lamborghini Aventador LP 750-4 Superveloce Roadster bumps the power to 750 horses and 509 lb-ft of torque, still directing all that energy to all four wheels.